The lane going to the park followed first in the ditch on one side of the road, then crossed over to the other, and back again. We bounced our way to the park, taking hours to make what should have been a fairly painless drive. At breakfast the next morning, we were told that pilings on the bridge to the hotel had been taken out in the night by an iceberg which had been calved by the very glacier we had hoped to watch drop its ice load into the lake. We watched the helicopters make trips evacuating backpackers from the high country down to safe ground. 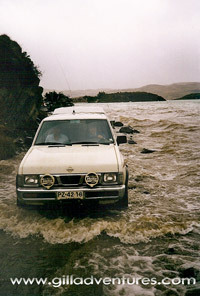 The streams had swollen and left people stranded, and several had been injured trying to cross the now dangerous water. Neither in immediate peril nor injured, we were not destined for a ride. Well, at least not in a helicopter. I was the first to go without the real climbing seat harness. The workers found some rope and made a loop around my waist which was so loose that I had to hold the ring of rope up to prevent it from slipping down around my knees. I envisioned what would happen should the bridge give way. The weight of my backpack would immediately flip me over and I would land head first into the icy torrent of water below. Then the rope would slip off my hips and past my knees before I could catch it. Either with my feet tangled in the rope or floating free downstream, I would be carried to the bottom by the weight of my belongings strapped to my back. Unfortunately, shortly after the van left, the park ranger told us that one, there was not another van coming until morning, and two, they would be locking the station for the night shortly. An e-mail came the other day from a couple who worked for us during our final season at Rock Springs Ranch. Brilliant young people, Josh and Emily are headed off to a new adventure in southern Chile, teaching English. There are three towns where they might end up, two of which John and I had visited some years ago. Their news brought back memories of our trip, filled with the raw beauty of the region and impacted greatly by the weather. 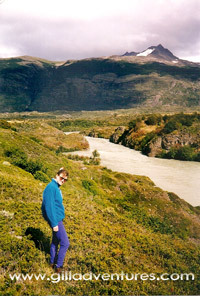 I told Emily our story of being flooded out of Torres del Paine National Park. John had been off on a boys’ adventure rafting the Futaleufu River with our friend Jim. I arrived in Santiago just before they finished the float, and was met by Jim’s wife, Nene, who had been visiting family. We all converged on Puerto Montt, the first step on our way to the park. I didn’t realize,when we were planning this trip, just how convoluted it was to be. Santiago from Oregon is rather a push, then on to the Straights of Magellan and Punte Arenas. Up to Puerto Natales, driving to the park in a rented Nissan miniature crew cab pickup. The park, or so it seems, is seriously the ends of the earth. They were in the process of replacing the road surface from Puerto Natales to the park entrance. Rather than tear up one section at a time, they had removed one lane of the road for the entire 90 miles. The lane going to the park followed first in the ditch on one side of the road, then crossed over to the other, and back again. We bounced our way to the park, taking hours to make what should have been a fairly painless drive. The park itself is spectacular, although the heavy rain and clouds did not allow for the truly famous views we had anticipated. We drove through the park to the farthest end, following for quite a while the shore of Lago Pehoe and the river downstream where the water flowed from the lake. The road was perched just above the water, hugging the rock wall that bounded the lake and river along its banks. I believe Lago Grey is as far into the park as one is allowed to drive; it was certainly the end of the road. Hosteria Lago Grey sits close to the outlet of the lake, looking up toward the glacier and mountains. We could not see this when we arrived; the rain and clouds blocked most of the view. Unfortunately, the weather also stopped the ferry from running. I had looked forward to the boat ride across the lake to see where the glacier met the water and calved into to the lake. Conditions were such that this was not possible. We were, nonetheless, happy to have arrived after days of travel, hours of gravel road shoulders, and riding in a small truck cab in the pouring rain. At breakfast the next morning, we were told that pilings on the bridge to the hotel had been taken out in the night by an iceberg which had been calved by the very glacier we had hoped to watch drop its ice load into the lake. The rain had caused an exceptionally large piece of ice to break free and float through the lake to the river that feeds from it. The high waters of Rio Grey had washed it down and into the bridge. Having no alternative, we would leave our red Nissan pickup and the rental company would have to retrieve it when the water had retreated. We would be evacuated when the park officials came for us, so we were to stay close and report back every few hours. Remaining close to the hotel was hardly a problem at this point, in that there was nowhere to go. The flooding had covered all trails near water, which is to say, any that do not go directly up the mountainside. We did hike upwards for a short time, but there would be no payoff of an excellent view at the end because it started to rain again, so our motivation was little and our trekking was short lived. Besides, we were to meet back at the hotel shortly. We watched the helicopters make trips evacuating backpackers from the high country down to safe ground. The streams had swollen and left people stranded, and several had been injured trying to cross the now dangerous water. Neither in immediate peril nor injured, we were not destined for a ride. Well, at least not in a helicopter. The day wore on, and our evacuation would have to wait. There were others in much greater need than us, and they were clearly the priority. We would report in again at breakfast to learn the latest plan. Following lunch, the park officials arrived to take us out. Our bags in hand, the handful of guests all made their way to the bridge over Rio Grey. With its missing pilings, a section of it hung like a suspended rope bridge. Although it could certainly not carry the load of a vehicle, the rangers and emergency response workers were walking across without any issues. They wished to take no such risks with the tourists, however. Or, at least, look like they would not. They had one climbing harness and planned to belay us across. First to go was a tall woman, the whole process taking some time. The harness returned and another guest stepped up to be fitted. Before they were ready to go, it was fairly clear this would be painfully slow and we would not have time to get everyone out. I was the first to go without the real climbing seat harness. The workers found some rope and made a loop around my waist which was so loose that I had to hold the ring of rope up to prevent it from slipping down around my knees. Onto this they tied another rope, and told me to cross. Donning my bag-with-backpack-straps on my back, the kind designed for trekking train stations rather than mountains, I set off. I envisioned what would happen should the bridge give way. The weight of my backpack would immediately flip me over and I would land head first into the icy torrent of water below. Then the rope would slip off my hips and past my knees before I could catch it. Either with my feet tangled in the rope or floating free downstream, I would be carried to the bottom by the weight of my belongings strapped to my back. Having watched the rangers walk the bridge several times, I pushed this thought from my mind and headed for the far side without incident. At the administration building across the river, we met with others being evacuated and were to ride out in a caravan of small pickup trucks. As damp bodies squeezed in, I stopped in the door. The air inside was suffocating, wet with clothes and exhaled breath, and the windows steamed. John and I asked to ride in the back, and made ourselves comfortable sitting on the built in extra gas tank in the bed of the truck. Still in the rain, but dry in my Patagonia hard shell, which was, ironically, named the “Torres,” I was far more comfortable that I would have been in the cab sitting crouched on someone’s lap. Our perch also gave us a better view of progress around Lago Pehoe. The road which followed the lake was now under as much as two feet of water. In front of our caravan as we drove through this was a man in hip waders with a long stick. He cleared the debris which had floated into the route and criss-crossed in front of the truck while tapping the road with the end of his stick to make sure it was still there. Safely on the far side, we were dropped with the gathering crowd at the ranger station. Eventually a van came, and again people squeezed in until there was no more room. Our group of four and a few others opted to stay behind and catch the next van to Puerto Natalos. Although it was now almost dark, they had opened the ranger station to us, and we were able to wait inside. Unfortunately, shortly after the van left, the park ranger told us that one, there was not another van coming until morning, and two, they would be locking the station for the night shortly. Now, normally, I love travel to places where I either do not speak the language, or where my version of said language is completely lame. This is one of those moments when I was really glad to have a native speaker with me who could be much more clear than I. We had no tent, we were not backpacking. We had come from a hotel, and would not be able to spend a night outside. Yes, they would bring another van. And, they did. I slept in it the whole way into town. In Puerto Natalos, we ended up at a hotel on a fjord rather than a lake, and took a boat the next day to a different glacier. One which had receded from the water and would not calve icebergs for us. But, in the end, that was OK.